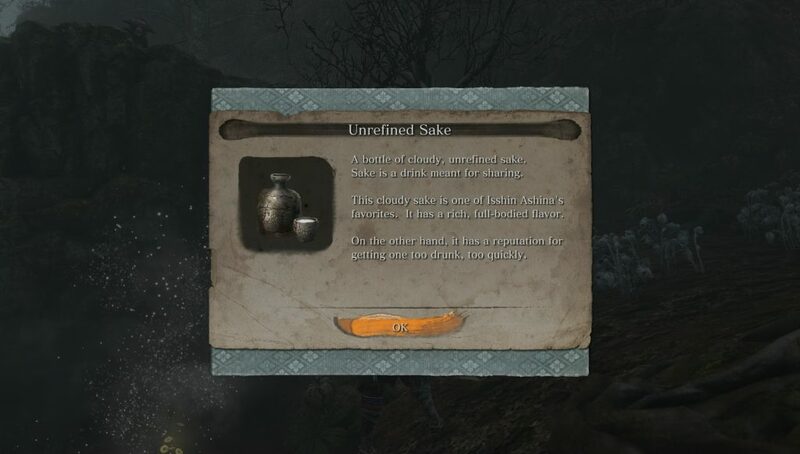 Sake is a key item in Sekiro: Shadows Die Twice. There are four kinds of it – Ashina, Unrefined, Dragonspring and Monkey Booze. You can give these items to either Isshin, Emma or the Sculptor, and they’ll tell you more about themselves. When you first find one, you might wonder who’s the right person to give it to. Thankfully, there are three of each kind, so you won’t have to choose – you can give one of each to every one of these NPCs. This guide is going to show you Sekiro sake locations, to help you find out more about the characters. One of these is in the Sunken Valley area. Spawn at the Riven Cave idol, then go into the cave and through it. Use your grappling hook on the hands of the giant statues to get to platform on the far side of the gorge. You’ll find a group of a dozen or so monkeys there. Kill them, and you’ll get the booze. Another one is at Senpou Temple. Go to the place where you find the White Pinwheel, then head up the planks and ledges to the building. You’ll end up in front of a blocked door, and you’ll see a hole in the wall to the right. Go through the hole and get the booze from the statue’s hands. The final bottle is in the Ashina Depths, near the Guardian Ape’s Burrow idol. Spawn there and follow the tunnel across the room from the ledge. When you get to the dying NPC, use your hook to get to a tunnel high up on the right. You might need some time to find the right position. Crawl through the tunnel and once you’re out, look for a monkey next to some bones. The booze will be there. You can get one by killing a mini boss called Tokujiro the Glutton, in Ashina Depths. Spawn at the Hidden Forest idol and head to the burnt temple. Once you’re there, go to the left side and follow the cliff back towards the idol until you see a big branch. Grapple onto it, then jump to the right and go through the passage. You’ll find Tokujiro in the clearing below. You can get the second one by defeating Juzou the Drunkard in Hirata Estate, in the courtyard near the Main Hall idol. The third one will be a gift from Isshin Ashina after you defeat Genichiro at the top of Ashina Castle. You’ll get the first bottle of Ashina sake pretty early on. You’ll need to get the blood sample from a Dragonrot victim to Emma. After she studies it and tells you of the way to heal it, go to the idol and use the Dragon’s Blood Droplet to cure everyone. Talk to the Sculptor, then to Emma. She’ll thank you for helping him, and give you the bottle. You can get another one in Mibu Village. Keep to the cliffs on the left side of the river. Once you’re past the houses, you’ll reach a couple of fields with several ogres wielding hammers. There’s a small shrine at the far side of the fields, and you’ll find the bottle next to it. As far as we know, you can only get the third bottle if you pursue the Purification ending. When you face off with Owl at the top of Ashina Castle, choose to break the iron code. After the fight, go to Kuro and talk to him until the bowl in front of him lights up. Rest at the idol, then eavesdrop on him from behind the corner. When he says “We’re almost there”, you can rest again and head upstairs. Talk to Emma and pick the option with “I agree. Kuro cannot be allowed to die.” Teleport to the Old Grave idol and look for Emma by the grave on the left. Talk to her again, then head to the Dilapidated Temple. Go around it and eavesdrop on Emma and the Sculptor. Confront her and keep pressing her for answers until you get the Father’s Bell Charm. Use that on the Buddha statue, and you’ll end up at the Hirata Estate once again. Now go to the Juzo arena and look for the bottle in the small house on the left. The first bottle of Dragonspring sake is being sold by the Exiled Memorial Mob, the one in Mibu Village. You’ll need 1000 sen to buy it, and if you need help finding the vendor, check out our Memorial Mob merchant locations guide. You can get another one by giving a key item called Water of The Palace to the crazed priest in Mibu Village (the one in the house with the shinobi door on the floor). To get this item, you’ll need to visit Fountainhead Palace. Spawn at the Flower Viewing Platform idol, turn around and go into the courtyard. Hug the right wall and you’ll soon reach a hole filled with water. Dive in, and when you get out, you’ll find yourself in a room with a bunch of items, including the Water of The Palace. The last bottle is at the Fountainhead Palace. It’s next to the Great Sakura idol, where a group of Okami spawns. Most of them have blue pants, but one has a purple garb. That’s the one that drops Dragonspring sake when you defeat him.